Beat egg product, chives, milk, salt, thyme and pepper in medium bowl; set aside. Spray 10-inch nonstick skillet with cooking spray. Add bell pepper; cook and stir over medium heat 1 minute. Add potatoes; cover and cook 8 to 10 minutes, stirring frequently until potatoes begin to brown. Stir in Canadian bacon; cook and stir 1 to 2 minutes or until thoroughly heated. Add egg mixture to skillet; cover and cook over medium-low heat until set, 6 to 9 minutes, lifting edges occasionally to allow uncooked egg mixture to flow to bottom of skillet. Sprinkle with cheese. Cover; cook until cheese is melted, about 1 minute longer. Cut into wedges. “I've been trying to work exercise and stretching into my morning. 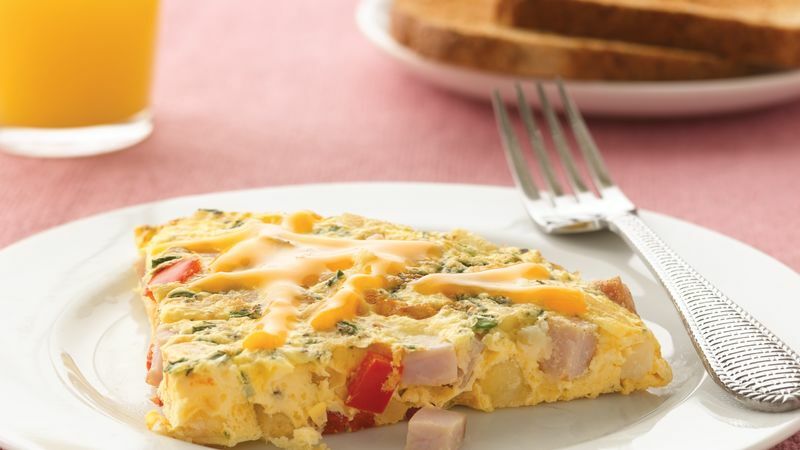 Nothing gets my heart started in the morning like a great breakfast, especially this frittata that is hearty and heart-friendly.” Kevin W.
Try egg substitutes, and you’ll be in for a pleasant surprise. They can replace whole eggs in nearly any breakfast dish without a loss of flavor or texture. If you are watching your cholesterol, they make a tasty alternative to eggs!